Photo by Michael Kelly A representative of Deep Well Drilling demonstrates a virtual reality training system used by the company for an attendee at the Marietta College Oil & Gas Technical Exhibition held Friday at the Dyson Baudo Recreation Center on the college campus. 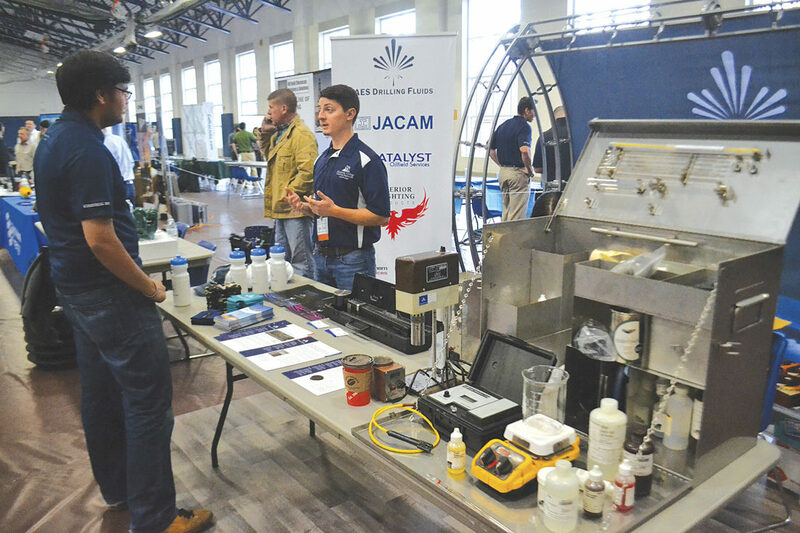 Photo by Michael Kelly A student talks to a representative from AES Drilling Fluids at the first Marietta College Oil & Gas Technical Exhibition held Friday at the Dyson Baudo Recreation Center on the college campus. 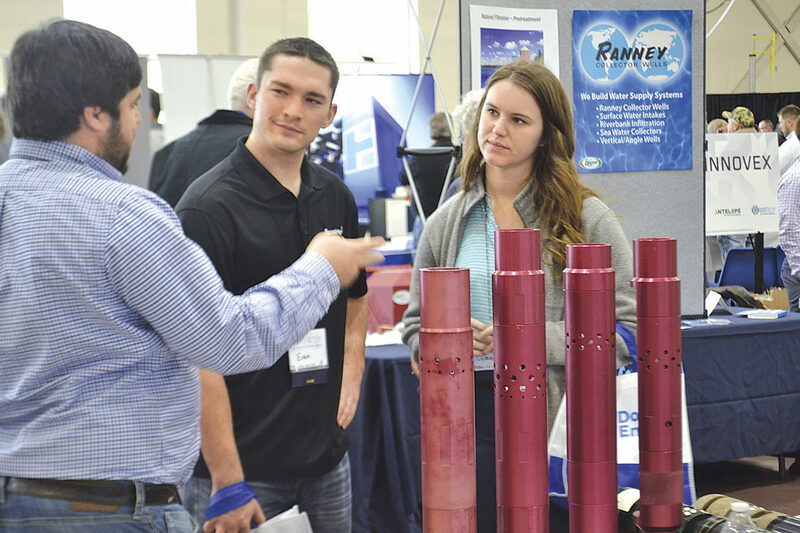 Photo by Michael Kelly Attendees talk to a company representative with a perforated pipe sample at the first Marietta College Oil & Gas Technical Exhibition held Friday at the Dyson Baudo Recreation Center on the college campus. 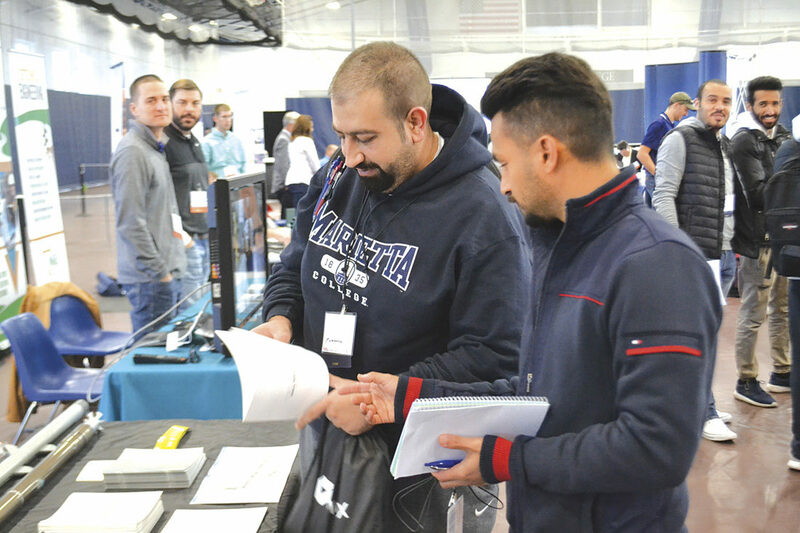 Photo by Michael Kelly Two petroleum engineering students from Marietta College look at literature from a company at the first Marietta College Oil & Gas Technical Exhibition held Friday at the Dyson Baudo Recreation Center on the college campus. 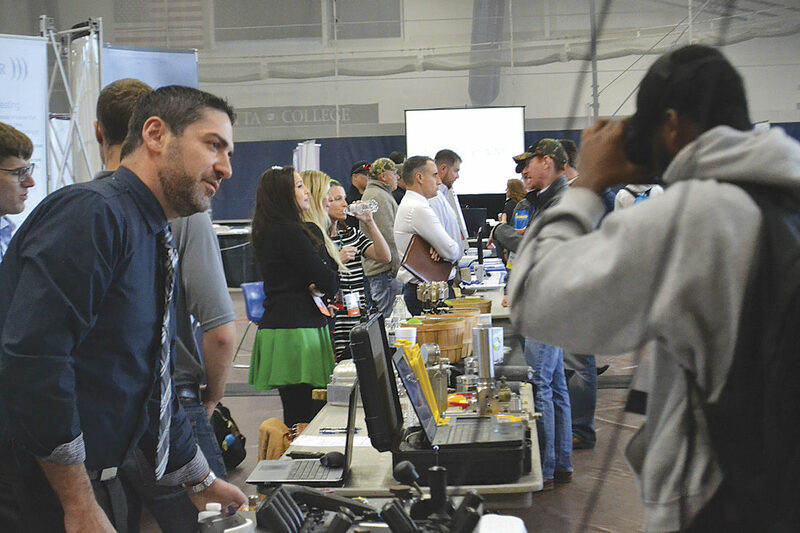 MARIETTA — The first Marietta College Oil & Gas Technical Exhibition is not likely to be the last. A senior in the college’s petroleum engineering program, Levine said Friday the idea emerged in the spring and got rolling in mid-September. By the end of October, he said, they had to turn away companies interested in exhibiting because the roster was full. Chris Lee, an account manager for Baker Hughes, was one of the company representatives staffing the booth for the global oil and gas servicing company. The booth got many inquiries from students looking to get into the industry, he said. At the Trans Canada Pipeline booth, company representative Dave Adler was busy. Trans Canada specializes in gas and oil transportation and storage, he said. Marietta College junior Shannon Patberg was roaming the exhibits, talking to company representatives. Patberg said she is majoring chemistry, which could have applications in the refining process, but she said she’s not yet committed to going into the industry. Deep Well Services, a division of Sun Energy based in Pennsylvania, saw a steady stream of people trying out their virtual reality training system. 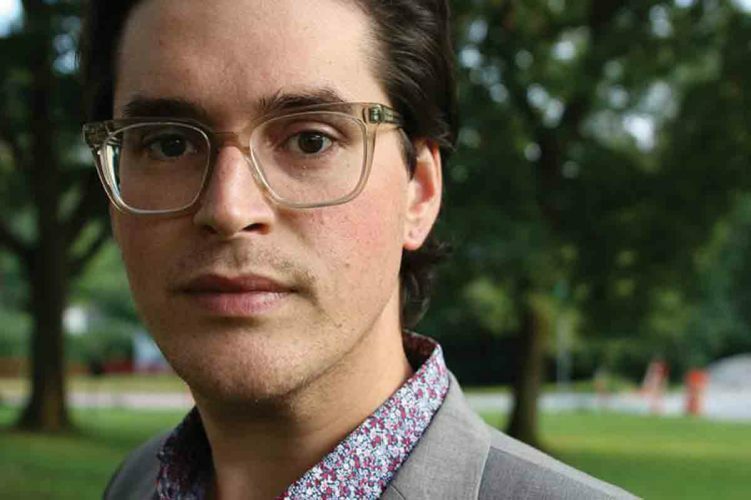 Johnny McAllister, the company’s chief operating officer, said it specializes in completing fracked wells and an effective training system is necessary because the work is dangerous. “We’re working on live, pressurized wells,” he said. McAllister is a 1984 graduate of the Marietta College petroleum engineering program. “It’s one of the top in the country, well-respected,” he said. Deep Well views the students and others who attended the exhibition as potential customers, he said. Mohammad Al-Aryan, a petroleum engineering student, said the exhibition was a good complement to his studies. “Drilling, new technologies, tools for perforation, instruments … there are even internships,” he said. Andrej Goreta, a recent graduate of the petroleum engineering program, drove from Cleveland to attend the event. Levine, looking at the activity in the center, seemed confident the event would continue into the future. 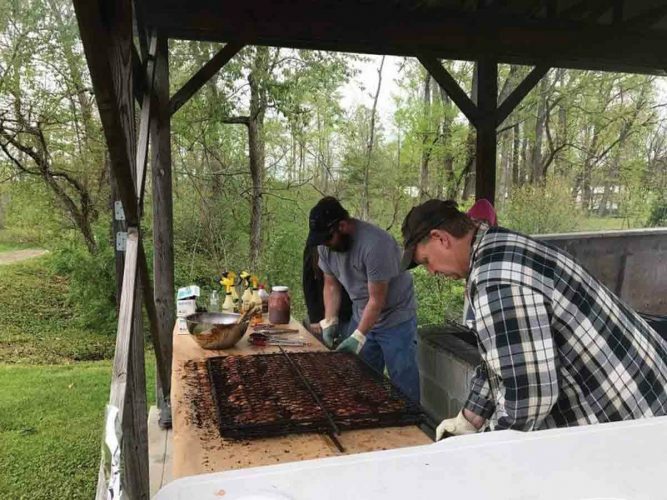 Although employment in the industry surges and recedes with the volatility of the industry, it appears to be stable for the time being and possibly, with the announcement of a major agreement between the state of West Virginia and a Chinese investment corporation for gas extraction, to be on the verge of an upswing. “This is still one of the lowest-cost areas in the world to produce natural gas,” Lee said.